At the Maitland Institute, Nicholas Hlobo presents an immersive installation titled Umthamo. 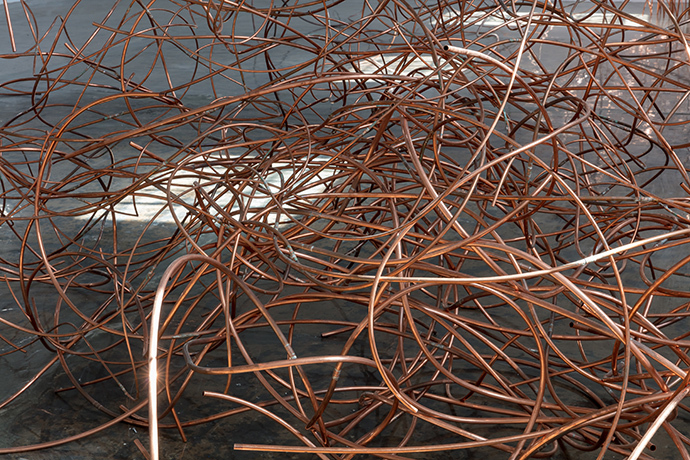 In this exhibition Hlobo elevates his investigation of the materiality of copper through a playful engagement with space. Pipes are planted in wood and arranged in dense, permeating masses. The title references feeding, and Hlobo alludes expansively to the experience of nourishment. The tangled, ecstatic shapes are a reflection of the movement of grasses in the wind, the force of blood through the capillaries, the stimulation of cells for sustenance. With its robust occupation of space, and sensitivity to the convolutions of process and movement, Hlobo’s Umthamo expresses a relish of the interchange between the macro and micro environments, and the interrelatedness of the self with one’s surroundings.